Only two weeks of Dear Data were left at this point, and it has been hard to decide what would be the last two topics to cover within this year-long effort of getting to know each other trough our data. Stefanie had a neat idea or week 51: how about privacy? How about counting and drawing all the things we wouldn’t want the other person (and the whole world) to know? That for sure would reveal a lot about ourselves, even if all our logs would be disguised by our categorizations. I tracked everything that came to mind, and everything I did or reflected upon that for some reasons I wouldn’t like other people to know. Anything spanning from how mean or needlessly grumpy I was with my boyfriend to some deep obsessions of mine as they popped up; from some black thoughts I wanted to bury to shameful habits I realize I have. I wrote down the exact thought or action I would want to keep private when it occurred, and I noted down the “level” of discomfort I would associate to it going public. I detailed my logs with information only afterwards, categorizing and classifying my private-things at the end of the week before crafting my postcard. There are weeks like this one when you can simply log the exact item (i.e. writing the whole thought or action) and easily come up with groups and sub-labels only later on. - and me as a person. But I then added some details to give Stefanie a more precise idea of what I was trying to hide, and per each category I went a little deeper, as you can see from my legend. I also incorporated information about ‘why’ I would want to keep it private: was I ashamed? Did I fear people judgement? Would somebody be hurt if they knew? Did it reveal I am a terrible person? Was I scared of what could have happened? This was one of those insightful weeks to me. One of those when by having to acknowledge specific dark sides and bad behaviors of myself, I realize them incredibly more vividly. Weeks of this kind, when you have to face your worst self, have been the hardest to deal with, but the sort of objectiveness that ‘counting’ implies gave me the opportunity to overcome the fear of addressing these tricky matters. So many times this week I felt ashamed. I felt ashamed of thinking I am not particularly inspired by my work at the moment, even for small bits of time. I felt guilty I would prefer not to take the time to talk with a friend in need. I felt bad multiple times for how I don’t value enough my relationship to my boyfriend and how easily I snap at him for trivial matters. I felt embarrassed for my need to be in control of the situations I am in: needing to know and decide what time are we doing something, which place are we going to, what is the exact plan for the day, what are we doing next… Other shameful feelings were triggered by my weird relationship with food and the fact that I don’t really enjoy it, and would rather not spend time dining or tasting (and talking about) particular foods as my friends like doing. Or by how un-necessary splurging I sometimes indulge to. Or by how I am and how I just can’t stop wanting more and, ultimately, being permanently unsatisfied. Why am I revealing so much? Aren’t I afraid anymore? I love Stefanie’s card, how clever was to physically “cover” her logs with a black mark, on a week where we track privacy! Well, I definitely now would love to know more about her logs! - I would love to some other projects / collaboration with Stefanie after Dear Data, but I am afraid of asking. This has been a year of relative openness between myself and Giorgia, but we felt we should also focus on the parts of our lives that we would prefer to keep to ourselves. As mentioned last week, I was gathering my private moments as they happened, but due to the Big Phone Meltdown of 2015 I lost this data, so I had to rely on memory to make a list of remembered private moments to draw this week, so this week’s visualisation has become a representation of ‘private moments that stick in my mind more than any other private moment due to how embarrassing / awful / cringeworthy they are’ (I know you data people out there need a transparent and honest methodology, so that detail is just for you, ha). We are one week away (!) from finishing this project, and over the year I have tried to be relatively honest in presenting my life in ‘data form’ to Giorgia, but of course, if you were able to peer into the depths of my mind you wouldn't be too surprised at the thoughts lurking within: unpolished, dark and unquestionable thoughts showcasing an uncivilised human at their worst. I guess this dark messy chaos is likely what all of our minds look like inside, and it's only when we edit and package up our thoughts and behaviours in a way befitting our society that we can say we are truly civilised. Civilisation requires an audience, otherwise when left to our own devices you’ll find us in our pants/underwear in the kitchen spooning peanut butter directly from the jar to our mouths... And DOUBLE-DIPPING the spoon (shock / horror). As Giorgia has been the ‘audience’ for this weekly reveal of myself for the past year, while I definitely have told her things that I don’t just tell anyone, I’ve obscured data points that might be TOO embarrassing, categorising them using careful euphemisms and creating a tailored version of myself. Just another example of how a dataset is never objective, I suppose. Because of this continual shaping of what I reveal weekly to Giorgia, I’ve decided to categorise my data according to how embarrassed I would feel if she found out what these private actions or thoughts were. When looking at the data from my ‘uncivilised self’ I’ve remembered from this week, I begin to blush at this list of moments or thoughts that I wouldn’t share with others, but equally I revel in how joyfully human, messy, and unpolished they are. Strangely, it’s in this messiness where I see evidence of my humanity and my sense of self the most, and while yes, it makes me cringe, it also makes me happy to be alive. This small, domestic dataset of private moments reminds me of the bigger-picture importance of data privacy. While my interest in data may lie more with finding humanity in the numbers as opposed to creating projects and discourse around the issue of data privacy, I agree we all need a space (either physical or digital) away from an ‘audience’ to be the messy, chaotic animals we truly are in order to fully understand what it means to be human, and to be ourselves. As Giorgia has often said, we need to remember that these cold data points represent warm, imperfect human beings (who might be sitting in their pants eating peanut butter directly from the jar as I write this). 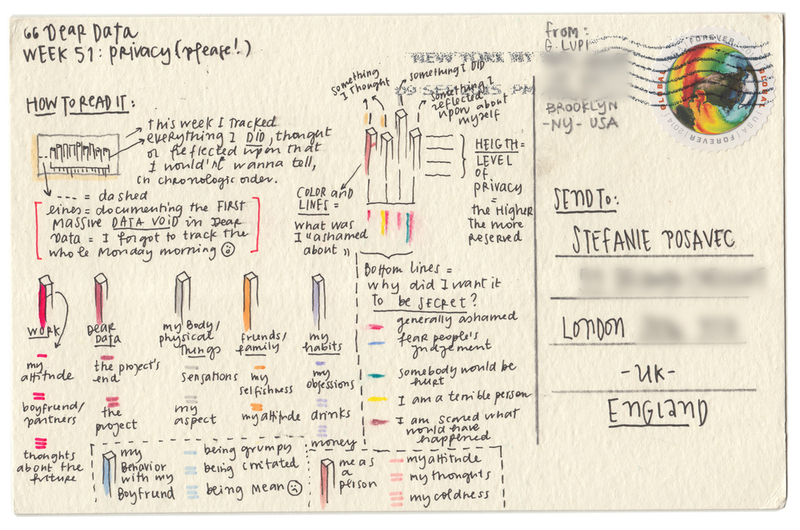 To draw this postcard, I started by gathering honest data, then wilfully obscured this data, and then created a visualisation of this obscured data, which I reinforced visually by drawing black inky circles over the data visualisation as though I was hiding something. I think the sheer perversity of the ‘visualising in order to obscure’ process makes this one of my favourite postcards of the year. And on to Giorgia’s postcard. I laugh that Week 51 is her first proper DATA VOID, whereas I have had a million! Her most private moments are those where she is grumpy or mean to her boyfriend, and for this I can relate, of course, and we commiserate together about this often, talking about how we get grumpy easily and say not-very-nice things in haste that we often regret later. I like how after a year, I’ve been able to really understand how different Giorgia and I are in many ways (I mean, we disagree on so many design things it’s almost hilarious), but that when it comes to the deeper parts of our personality we are often very similar.